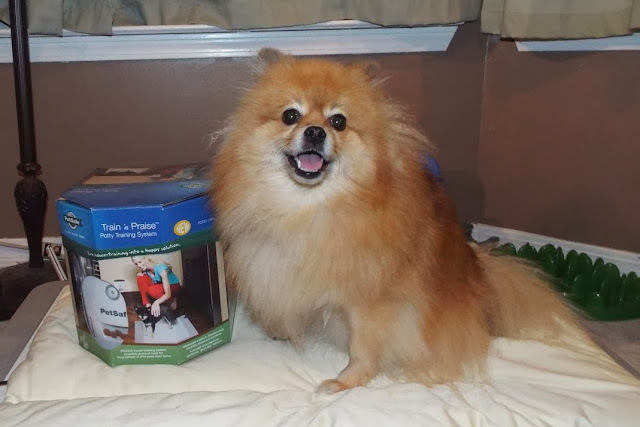 Let's bark about potty training! Humans are always asking Mom if I was hard to potty train. They've all heard it is really hard to potty train little dogs. I was closely supervised as a puppy, but not all puppies have humans who watch them constantly. 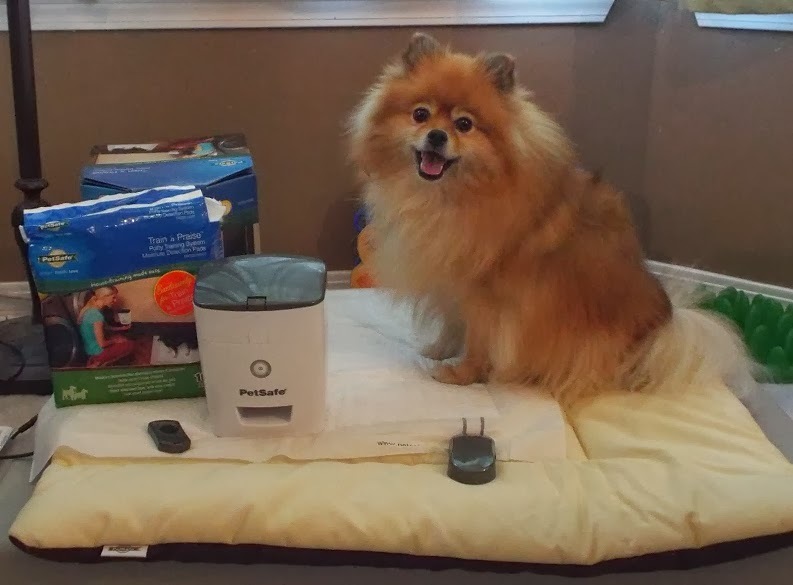 My pals at PetSafe have invented a pawsome machine to reward a puppy for peeing on a pad instead of the carpet - even when the humans aren't looking. This furrific machine is called the Train 'n Praise - Potty Training System. We all know that consistency is the key to effective training. However, humans are easily distracted by their human world. A good little puppy could go potty on the pad, and not get a reward. Without that treat, how will that puppy know they did the right thing? The Train 'n Praise solves this problem, at least for pee. (Poop is less frequent, and more predictable.) The Train 'n Praise system uses special Train 'n Praise Moisture Detection Pee Pads. When a puppy pees on the pad, the clip-on sensor sends a message to the treat dispenser, and it spits out a treat. The puppy's good potty is rewarded, which will encourage the puppy to use the pad in the future. 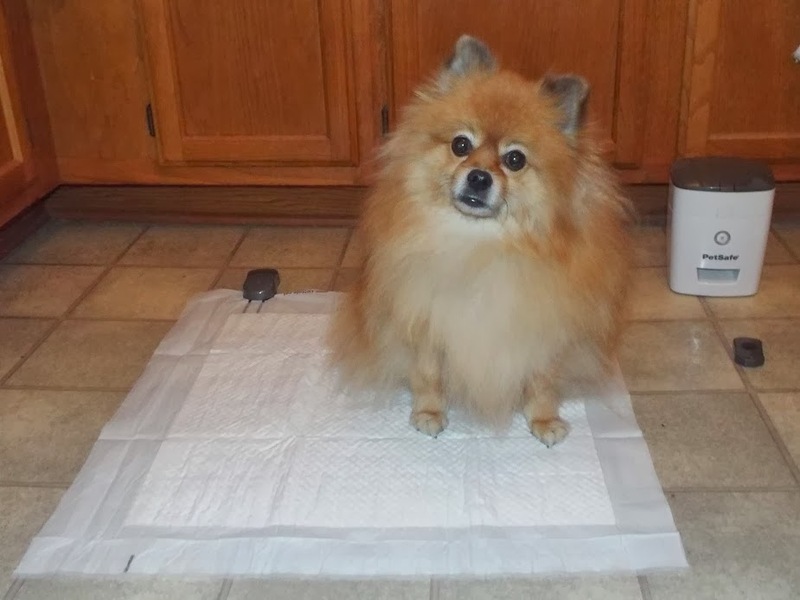 The treat dispenser, pee pad sensor, and remote control are all battery operated. 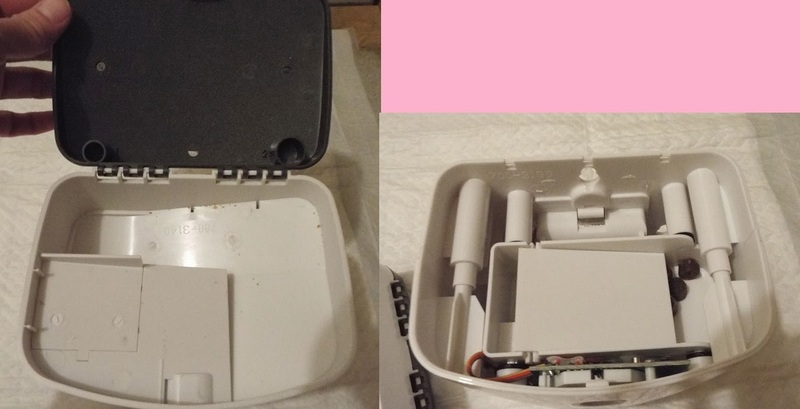 The treat dispenser uses 4 AA batteries, and the pad sensor & remote control each use a button cell battery. Guess what, batteries are included! You don't see that very often. BOL! It is easy to use, the pads have a drawing on them that shows you exactly where to clip the sensor. The treat dispenser has a switch on the back where you can turn the electronic sound effect on or off. It will still make the mechanical sounds when it releases a treat. The electronic sound effect is great for training, sort of like a clicker. I run to my Train 'n Praise and look for treats when I hear the sound. BOL! This feature is very useful for distance training. Just place the treat dispenser where you want your dog go (next to his bed). When your dog obeys and goes to the right area, you can press the remote, and the dispenser will give your dog a treat. The remote works up to 25 feet away. Ummm, Mom, you don't really expect me to potty in the kitchen. Do you? 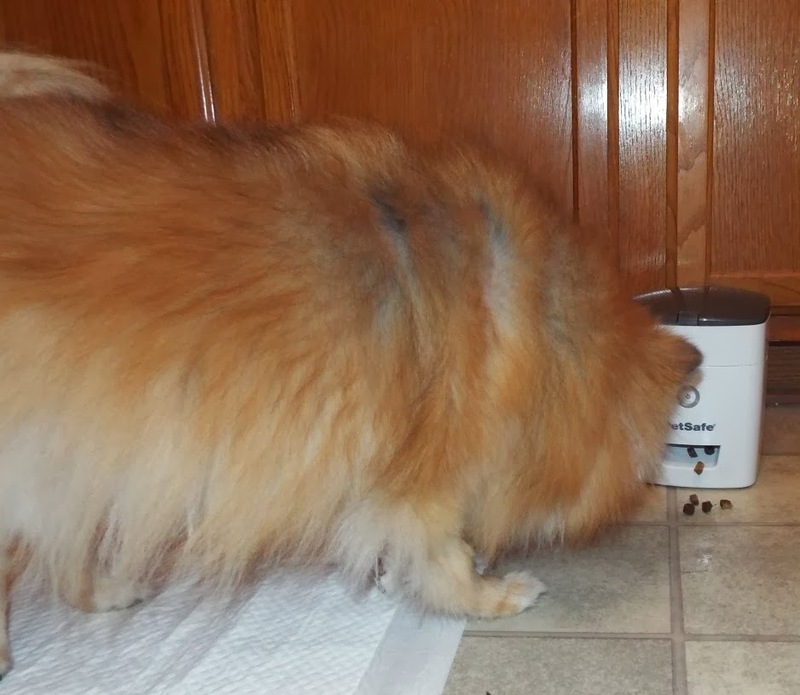 The treat dispenser has a ramp inside for the treats to slide down when the dispenser releases a treat. The treat ramp can be adjusted for 2 sizes of treats. There are two little sizing cups in the lid to show you which setting your ramp needs for the size treats you are using. I have mine set to large, even with small treats. I want to be sure they don't get stuck because I bark if I hear the treat sound, and no treat comes out. Sometimes only one treat comes out, other times several treats come out. I love when I hit the treat "jackpot" and lots of treats come out! BOL! Some treats work better in the dispenser than others. Round treats work the best. I think the dispenser prefers treats that are mostly the same size & shape. Rough & oddly shaped treats seem to be the ones that are most likely to get stuck. Some freeze dried treats aren't heavy enough to slide down the ramp quickly. So if your treats seem to get stuck, try a different kind. You want the treats to come out easily if you are training a young puppy. Puppies don't have long attention spans. BOL! You can use dry kibble instead of treats if you are worried about calories - provided your puppy considers kibble as a reward. For those of you who are already potty trained, the Train 'n Praise remote treat dispenser is also available without the pee pad sensor. The Train 'n Praise dispenser can be mounted on a wall (screws are included), set on the floor, or anywhere you choose to place it. Keep the remote where you can use it whenever you see behavior you'd like to reward. Mom likes to keep it next to the computer. She can reward me for being quiet - without having to leave her desk to get a treat for me. It is too late to reward me if I have to start barking again to make her give me a treat. BOL! I like that the dispenser is faster than waiting for mom to go open the treat jar. BOL! I have been wanting to get my paws on a Train 'n Praise since I saw it at Global Pet Expo 2013. If you'd like to get your paws on one - enter my giveaway! Login to the Rafflecopter for entry options. 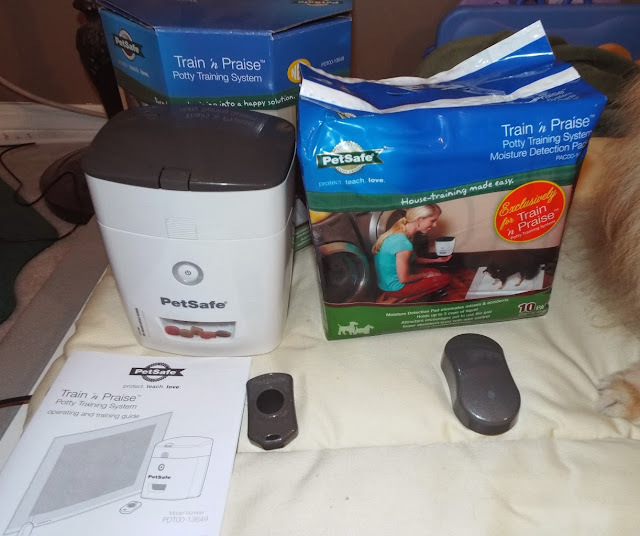 Of course, to be 100% sure you will get a Train 'n Praise, you can order one from PetSafe. That sounds furry cool, Pepper! We're both older and potty trained, but mommy can think of lots of ways to use a remote treat dispenser! My five Treeing Walker Coonhounds are housebroken and all know "sit", but could use some additional training with regard to things like "stay" and even "come". My deaf girl knows her commands by hand signals and I'd like to work with her on some additional "tricks". I'd Like To Work With My Youngest Dog On Potty Training,This Would Be A Great Tool To Use. I have a friend with an Italian Greyhound puppy who would love this! I would use this to train Artie to be quiet. He can be quite the barker. oooh! I could really use this in agility! I'd love to use it to teach go-outs for obedience too! My baby is potty-trained but could use some follow up work on "sit". She's getting a bit forgetful. This would be great. Also thinking of adopting a dog for my mumand may need to potty train it so this would be great there too. Thanks for the giveaway. Probably from barking and staying away from the door...too many strays here and cars drive way to fast, we are indoor dogs & have to make sure they are safe! Good luck everyone, this is gonna be pawsome for someone!! Great review as always Pepper!! Oh wow! This product looks AMAZING! Wow. This is incredible. I've never heard of such a product, and this is perfect for positive reinforcement. Really cool new invention. I have a similar product for training but did not know they made one for potty training. Very cool. I have a few patients that might be interested. Thanks for the information! What a thorough review, Pepper! And I love it when you smile in photos.